The DVD notes indicate that this video is copyrighted 1995, which is two years before the Karyn Henley and Dennas Davis version of The Beginners Bible and well before the 2005 update from Kelly Pulley. 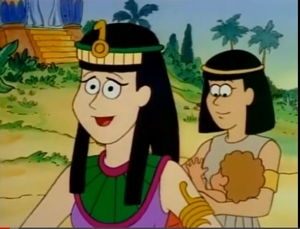 Don’t look for a similar style, because the rendering and animation in this Sony Wonder production seem more closely related to what we saw in the old For Better or For Worse comic strips by Lynn Johnston. The name “The Beginners Bible” is trademarked and has probably gone through many transmutations. 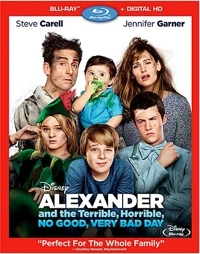 This DVD, a rerelease of a Sony Wonder production, will be available on March 3, 2015. The Beginners (no apostrophe) Bible DVD contains three 25-30 minute stories that are clearly designed for pre-school age children, because all the angst and negativity of the stories are omitted. 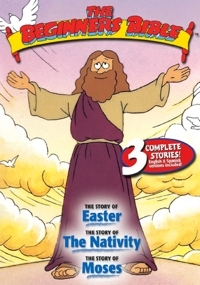 Some parents will argue that it’s wrong to sanitize the stories and gloss over the crucifixion or Herod’s killing of babies, while others will be perfectly happy to introduce their wee ones to the basic stories of The Nativity (Jesus’ Christmas birth), The Story of Easter (Jesus’ resurrection), and The Story of Moses (the Exodus from Egypt). You’d be hard pressed to find three cheerier versions of those Bible stories than the ones children encounter here. I wondered what a series like this would do with the crucifixion, but it’s minimized by having three crosses in silhouette, no human shapes immediately recognizable, and a voiceover that tells us “Jesus died on the cross with a thief on either side of him.” The emphasis in this episode is on the positive, as it is with the other two. Peter doesn’t deny Christ, Judas doesn’t hang himself, and Jesus isn’t flogged or have his side pierced as he’s hanging from the cross. Roman soldiers don’t gamble for his cloak. The focus is on Jesus’ teachings, his acceptance of his lot, his prayers to God, and his resurrection—with Peter diving into the water to swim to him when he first reappears. It’s a joyous celebration of the Bible stories that, however sanitized, are certainly likely to be more entertaining to young children and less traumatizing or confusing. Will it meet with parents’ approval? That depends on how traditional they are or how much of a stickler they are for details and tone. The Bible keeps evolving, and these stories are rendered in a style that could only be described as “cute.” Some may want more austerity or “seriousness,” but in the past, if such stories hadn’t come from the Bible, I’m guessing that more than a few parents and educator groups would have deemed them not age-appropriate. The Bible actually has a lot of violence and “begatting.” These three episodes are more age-appropriate, and they do seem like a good way to introduce youngsters to three big stories from the Bible. The kids may even want to watch them over and over, like other cartoons. “Different, but as good as Frozen,” my wife pronounced it. “Four stars,” both teens said. And Big Hero 6 was easily my pick for Best Animated Feature of 2014. We all loved it, though I have to admit the poster didn’t sell me, nor did my hearing that the story was about a main character named Hiro (Hero?) and his brother Tadashi. How in the world would Disney be able to deliver a robotics story involving Japanese-named characters without being locked into an anime style? Well, if you’re Disney, you confidently (and I might add, audaciously) create a future city named San Fransokyo, which, we learn in one of the bonus features, combines a geological mapping of San Francisco with the visual and cultural look of Tokyo—a hybrid that allows them to do pretty much anything, visually. That invented city, which was rendered using a new method called “Hyperion,” is so infused with vibrancy that you’re almost blown away by some of the cityscape scenes. That’s not surprising, given the fact that it’s Disney and they’re all about originality and heart. Both of those traits drive Big Hero 6, which takes its name and spirit (and a few characters) from an obscure Marvel comic book. Big Hero 6 tells the story of a 14-year-old robotics prodigy named Hiro (Ryan Potter) who’s already graduated from high school and hopes to be accepted into the nerdy robotics school his older brother Tadashi (Daniel Henney) attends. He visits the school and meets some of the other students, a quirky group that includes a tough bicycle-loving woman named GoGo (Jamie Chung), the neurotic and overly self-protective Wasabi (Damon Wayans, Jr.), and a fast-talking hyperexuberant chemistry wiz named Honey Lemon (Génesis Rodríguez). It’s an origin story, really, about how this group of brainy misfits comes together to form a superhero group called Big Hero 6, but it’s also every bit as much of a relationship story between a boy and robot as a film like The Iron Giant. The plot is set in motion when Hiro’s project on microrobotics blows away the competition at a big school science fair, and Professor Robert Callaghan (James Cromwell) hands Hiro a letter of acceptance after warning him not to sell his idea to billionaire businessman Alistair Krei (Alan Tudyk). As one of the animators says in a bonus feature, Disney has never shied away from the issue of loss, having traumatized one generation with Bambi and Old Yeller and another with The Lion King. A new generation will vicariously learn to deal with loss through this film, which begins with two already orphaned boys living with their aunt (Maya Rudolph) and introduces three situations where a loved one may have been killed. 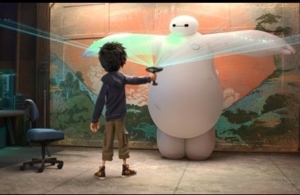 That’s as much as I can say without getting into spoiler territory, except to add that Big Hero 6 is full of emotion. 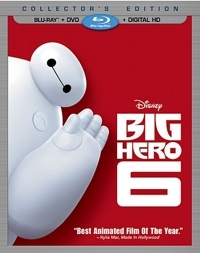 It’s also full of humor, with the soft vinyl robot Baymax (voiced by Scott Adsit) sharing the comedic duties with all the nerdy characters and a rich wannabe superhero friend named Fred (T. J. Miller). 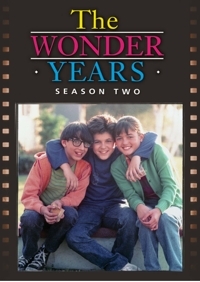 As I wrote in my review of The Wonder Years: Complete Series, this coming-of-age TV comedy-drama gets it right. Lots of things can shape a person, and just as WWII defined a generation, so did the Sixties—which historians date from John F. Kennedy’s 1963 assassination to Richard M. Nixon’s 1972 resignation. The Wonder Years managed to capture the perfect storm of events that were always in a family’s consciousness—even as the father tried to put food on the table, siblings fought and sought to find their place in the world, and the mother tried to hold them all together. Like Leave It to Beaver, the series’ episodes were seen from the point of view of an adolescent, and you knew you were in for an interesting ride when this 1988-93 series shunned a laugh track and introduced the kind of voiceover narrator that we got in A Christmas Story—an adult version of the main character. And you knew that the series would meet the ‘60s head-on when the pilot called for the girl-next-door’s older brother to be killed in Vietnam, and for our hero to comfort her in a scene that would culminate in a first kiss for each of them—both as characters, and as actors. 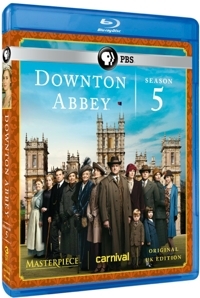 Downton Abbey is the most watched British costume drama series since 1981’s Brideshead Revisited and the second most-watched PBS series ever—behind Sesame Street and in front of The Magic School Bus. I’ve talked to a number of parents who watch the highbrow soap opera with their children and noticed this pattern: it’s easy to get hooked, but teenage girls like the show best, and teenage boys will watch if the whole family is doing so or if they’re trying to impress a girl. That’s no surprise, since there’s more intrigue in Downton Abbey than action, and much of the intrigue revolves around matters of the heart. Though nothing overly graphic is shown, there are scandals and affairs and secrets that people desperately try to protect.